If you want to watch the Oscars in the UK or any other country and you don’t have access to cable, then you’re usually out of luck. However, the entire event is being shown live online for free by Australian network, 9Now. There is one caveat though and that’s that you must reside in Australia or you’ll be locked out from watching. But not so fast. Before you put your dreams to bed of watching the stars collect their awards and all the razamataz of the ceremony, there’s a straightforward way to tune in from the UK or any other country. In this guide I’ll show you how by using a completely legal privacy app called a VPN. Who's up for awards this year? When can I watch the Oscars? Kevin Hart isn't hosting the Oscars, so who is? Who is likely to win this year? Watching the Oscars in the UK or any other country is extremely easy. Below you can follow the simple steps needed. It’s broken down into easy to digest pieces so even if you’re terrible with technology you’ll be able to complete this and watch the Oscars. The following should take you around 5 minutes to complete but don’t worry if it takes a little longer as the outcome is you get to watch the Oscars, yay! The first task is choosing a VPN service and there are so many out there it can be confusing knowing which to select. I recommend using ExpressVPN because they’re one of the easiest and they offer fast speeds. Fast speeds are critical when you’re streaming video all the way from Australia to the UK. Without fast speeds you’ll see more buffering than golden statues. TIP: Sign up for ExpressVPN’s 12-month package, it’s 49% cheaper than paying monthly! There are some other good VPN services like NordVPN and CyberGhost VPN so if you’ve got plenty of time to be comparing, then it’s worth checking them out too. Choose one and sign up. Once you’ve signed up you’ll need to download their app which will let you unblock 9Now and watch the Oscars in the UK or elsewhere. 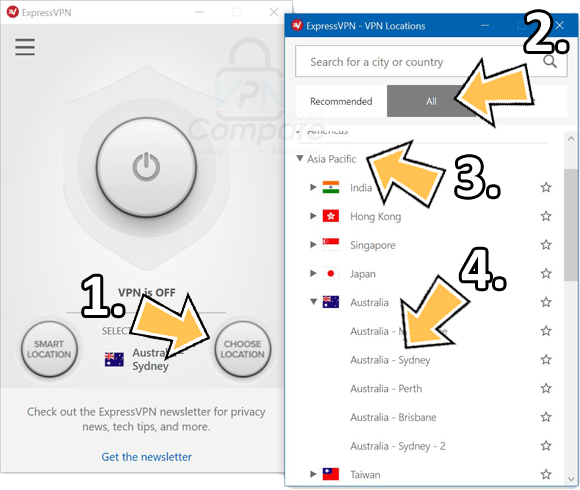 Using ExpressVPN as an example, you can download their Windows or Mac app directly from their website under the ‘Products’ section. If you’re using a tablet or phone then you can grab their app from your regular app store. Just search ‘ExpressVPN’ or if you signed up to one of the other services then search their name. Now you’ve got the VPN app you should install it and open it. The first time you open it you’ll need to login with your account details or if you’re using ExpressVPN on a computer activate it. You can find the activation code in your welcome email or the ‘My Account’ area of the ExpressVPN website. On ExpressVPN you can do this by pressing ‘Choose Location‘ (1) on a computer or by pressing the ‘…‘ button next to ‘Selected Location’ on a tablet or mobile. Then press, ‘All‘ (2) -> ‘Asia Pacific‘ (3) and find ‘Australia – Sydney 3‘ (4) and click on it. You might also need to press ‘Connect‘. Watch the Oscars using ExpressVPN. It doesn’t take long for the VPN app to connect. When it’s connected, you’ll need to visit the 9Now website. You can now watch the entire Oscars award ceremony from the UK or any other country in the world. All that’s left to do is grab yourself some nibbles as you watch the stars arrive on the red carpet guessing who’ll pick up awards for Best Actor, Best Picture, Best Director or one of the many others up for grabs at the Academy Awards. One of the most exciting nominations is Black Panther. Not only is it the first feature-length superhero movie to sport a near entirely black cast but it’s also the first superhero movie to be nominated for ‘Best Picture‘ at the Oscars. Elsewhere, Netflix movie Roma is expected to do well as is The Favourite. Both are nominated for so many awards you would need two hands to count them all (it’s ten each if you’re wondering). Emma Stone and Rachel Weisz are both up for the ‘Supporting Actress‘ award for their roles in The Favourite. A Star is Born and Vice are also in the running for ‘Best Picture‘ but they need not worry if either doesn’t get that – they’re both nominated for no less than eight awards so expect them to pick up at least one or two. The UK’s Radio Times website has a great round-up of all the nominations so check that out if you’re interested to know more. The Oscars will take place on Sunday, 24th February 2019. Live coverage of the Oscars is expected to start from around 1 am on Monday 25th in the UK although there’s likely to be some pre-awards build up shows, so it’s worth tuning in earlier. Kevin Hart isn’t hosting the Oscars, so who is? By now you won’t have been able to avoid the controversy surrounding the Kevin Hart episode. Yes, that’s right – he won’t be hosting the Oscars. So that leaves the big question of, who will? Well, no one. There’s going to be no overall host of the show for the first time in nearly 30 years. There’ll be a vast panel of famous faces presenting the awards though. But as far as a ‘Master of Ceremony’ is concerned, there is none. How this will pan out is anyone’s guess so you’ll have to tune in on the 24th (or 25th in the UK) to find out. The Favourite and Roma are up for numerous awards so you could put money on them picking up at least some of them. Where they’re nominated for the same award, you’ll have to keep guessing who’ll take it. The recent BAFTA ceremony in the UK is a good indicator of who’ll pick up awards at the Oscars. With Olivia Coleman and Rachel Weisz picking up Best Actress and Best Supporting Actress and Roma taking Best Film, you can expect similar results at this year’s Oscars. Don’t forget all you need is a VPN from ExpressVPN and you’ll be able to stream the Oscars live in the UK or any other country on 9Now.